I offer a number of services to support women during their cyclic and non-cyclic years, including hormonal wellness, fertility, pregnancy and postpartum support. As optimal results are obtained when healing is seen as a process, one-off treatments are no longer offered but rather Treatment Packs where you commit to a minimum of 3 sessions. These packs incorporate several of the treatments for consistency in your treatment. If you are looking to improve your hormonal balance, optimise your fertility, receive post-partum TLC or heal any pregnancy or birth-related trauma please get in touch at hello@yosoygaia.com to arrange a FREE 15 minute telephone chat to work out the best plan of action for you. A Womb Blessing® is a one-to- one infusion of Divine Feminine healing energy, a transformative healing experience, awakening and restoring our female energies and reconnecting ourselves to our awareness of our authentic female nature. The Womb Healing is a reiki-style treatment that works to balance the feminine archetypes (Maiden, Mother, Enchantress, Crone), restore their energies and release emotional/psychological/physical blocks and obstacles. In a Womb Healing, we work with balancing your own energy and restoring the balance within your cycle. The abdominal massage aimed at promoting fertility and easing any abdominal and womb disease or ailments comes under many names and certifications but in the end when researched, you can see it comes mostly from native tradition and notably from the North American, and particularly the Mexican and Central American “parteras” including the Mayan parteras or birth experts who generously and often freely provide this ancient wisdom to one and many. 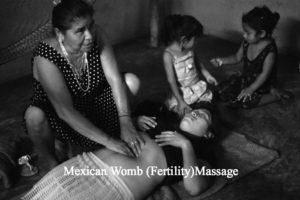 This type of Mexican massage is known as SOBADA and it is a non-invasive, natural treatment that has been used for hundreds of years in many native cultures to increase the likelihood of conceiving a baby, as it increases blood circulation and relieves the uterus area from stagnant blood or energies, promotes egg health by increasing the ow of oxygen to the ovaries and strengthens the reproductive organs. “Cerrada” It is translated as ” Closure ” in English, and it is a Mexican postpartum healing ceremony, where the mother is anointed, massaged and wrapped. In English, or at least in the UK, it is mistranslated as “Closing of the Bones”, a name that to my teacher, the traditional Mexican midwife, Angelina Martínez is incorrect as it fails to describe the depth of the work at many levels It helps to nurture the mother after the birth journey into motherhood and can be performed in new Mummies or Mums whose babies are even 30 years of age ! A Cerrada is a celebration and a way to nurture women back into a sacred space after pregnancy and/or childbirth, both of which are very ‘open’ experiences which may leave us feeling raw and vulnerable. Everything during pregnancy and labour is about opening physically, emotionally, spiritually but once the baby is born, the traditions says that our body requires sealing or closing. From the physical perspective, the Cerrada facilitates the shrinkage of the uterus and all of the abdominal area and guides the bones and muscles back to their original position. Energetically, the ritual can also help “close” a Mother, as both pregnancy, and particularly the intense process of labour and child birth, can be very vulnerable times for a woman, psychologically and physically. The Cerrada ceremony is also a very healing experience in situations where there has been a miscarriage or still birth as we honour all women, their journey and hold their space so they can feel held and safe, allowing them to re-gather their energy and strength. A Cerrada session in Mexico is traditionally carried out with a special Immersion Bath ceremony. Once this has been carried out, the a Cerrada ceremony proper begins. You will be lying down covered with sheets and blankets as some parts of your body are massaged into a deep state of relaxation both with my hands and a rebozo (a traditional Mexican shawl). Your abdominal area will be also massaged before the closure itself (the Cerrada) takes place, where a number of key parts of your body are gently wrapped by the rebozo each in turn (head, shoulders, pelvic area, etc). At the end of the session, you will be able to rest in this peaceful state for a while with the firm hold of the rebozo allowing you to let go and go deep inside before being quietly unwrapped. As optimal results are obtained when healing is seen as a process, one-off treatments are no longer offered but rather Treatment Packs where you commit to a minimum of 3 sessions (which may include different types of treatments). Both the Cerrada and the Sobada can be carried out at your own home as part of a post-partum package, however, the cost will increase depending on the travel distance. Please get in touch at hello@yosoygaia.com to arrange a FREE 15 minute telephone conversation so you and I can agree on the best course of action for you. If you feel the call in your heart to train or learn more about some of these TRADITIONAL MEXICAN MEDICINE PRACTICES, Mayella organises workshops every year in the United Kingdom and Ireland, visit this page.